Stitch up some super-easy totes to carry your groceries (or any other essentials) in eco-conscious style! Make various sizes from grocery bag to city-chic magazine totes to cute little lunch sacks, all in Oasis Canvas, Marcus Brothers’ certified organic cotton made with eco-friendly dyes. Leave them plain, decorate with appliqués, or combine your favorite Oasis colors by making the bags from color-blocked fabric you piece together yourself. 1 1/4 yard Oasis Canvas (for a grocery-sized bag approx. Optional: 1 to 1½ yards webbing for handles, or cut from bag fabric. Side seams: Fold the length in half, with right sides together, so that the piece now measures 39" wide x 21"long. Sew the side seams, using a 5/8" seam allowance. Finish seams with a serger, or zig-zag stitch and trim close to the stitching. Press seams flat. Top hem: Turn in 1"along the top edge of the bag; press. Turn in 1" again and press. Stitch close to the first fold. Bottom: To create depth at the bottom of the bag, reach inside the bag, flattening out one corner so that it forms a triangle and the side seam is centered, as shown. Measure about 3½" from the point and draw a line across the triangle. (Fig 1). Stitch along this line, reinforcing stitching. Repeat for the second corner. Press the triangular corners flat against the bag bottom, secure with fabric glue or fusible tape if desired. Straps: (If using ready-made straps, skip to * below). Cut two lengths of fabric, 3" wide by your desired length (approximately 14" long to carry by hand or 34" to carry over the shoulder.) Turn in 1" on one long side of each strap and press. Turn in ¼"on the opposite side. Bring this pressed edge over the first, bringing it close to, but not completely covering, the first fold, as shown. (Fig 2). Zig-zag through all thicknesses of the strap, catching the second fold in the stitching as shown. Zig-zag again along the opposite long side of the strap. 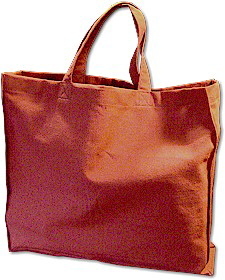 (*) Pin straps to top edge of bag, turning under ½" of the raw edge in, placing it against the bag for a clean finish, and spacing strap ends evenly. Hold the bag and adjust if needed for a comfortable fit. Stitch straps to bag, squaring the stitching and reinforcing with "X" stitching as shown (Fig 3). To give the bag some shaping, make vertical creases at the corners as you'd find on a paper grocery bag. Press, then stitch the creases in from top edge to the bottom of the bag. For a rigid bottom, cut plastic canvas to the size of the bag bottom. Cover with a fabric sleeve and insert into the bottom of the bag.